Harley Quinn, Superman and Batman take three spots in the Top 6 for team DC, yet despite this, Marvel is the one taking the title of 'Publisher #1' for June 2014, by 2.48% unit share. Following DC, Image Comics retains spot #3, despite losing its traditional #1 spot over on the Top Selling Graphic Novel chart to Archie Comics - but more on that later. Now, on to those Top 6! 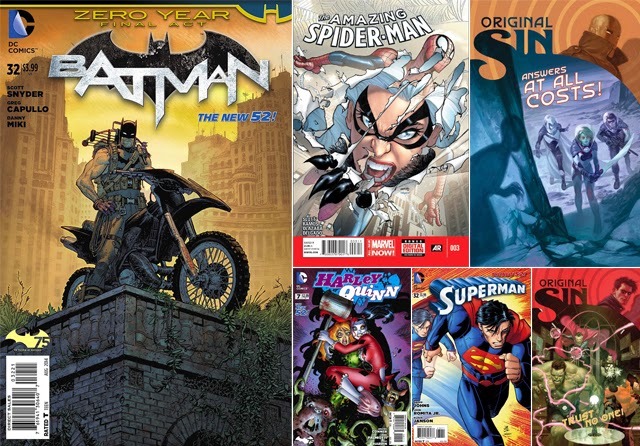 THE TOP 6 COMICS FOR JUNE 2014: 1) BATMAN #32 2) Amazing Spider-Man #3 3) Original Sin #3 4) Harley Quinn #7 5) Superman #32 6) Original Sin #4 - Full stats after the jump. MY THOUGHTS: It's always good to see Romita Jr's debut on any book in the Top 6, the little engine that could award has to go to Archie Comics' Afterlife With Archie: Escape From Riverdale TP topping the graphic novel charts. Truth be told, I've gone to drop this title myself in order to get my pull-list under control, but I literally can't. Each issue is more addictive than the other, and from a guy who put the cast of Richie Rich above Riverdale, that's saying something. Good to see the zombie fever is spreading. TOP COMICS OF JUNES PAST: World War Hulk #1 stomped across June 2007, while Iron Man and Spider-Woman locked lips in Secret Invasion #3 back in 2008. Topping it all off, Batman locked swords in one of the best Ras Al Ghul moments, in Batman #616 in 2003.